I should imagine the Liddle family moved from North Yorks moors area to Trimdon in the early 1800’s maybe around the time the pit was opening. I’m guessing the father was a farm labourer. As far as I can make out one girl was born at Trimdon & she was called Mary. John was a journeyman mason, in Whitby later on. He came from Old Trimdon, Durham in 1853/4, birth year. Can anyone tell me anything at all? I am hoping that someone can help share some information about a John ( Jack ) Storey. I know he was born at Trimdon Colliery, I am led to believe he had 4 brothers and 1 sister. His mum Ellen/ Eleanor lived on (Heather Send Road? in Fishburn) I believe Jack moved to Dorset and did have a son from that I know nothing more if anyone knew of this family or has any old photographs I would be so grateful to hear from you. 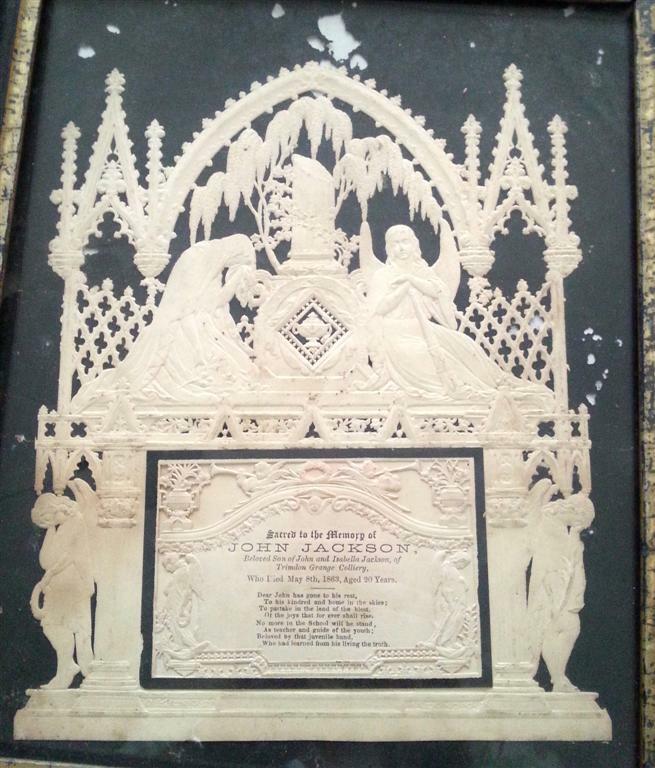 My family has a memorial cut out in memory of John Jackson who died at Trimdon Grange Colliery on 8th May 1863. He is son of John and Annabella Jackson although it wrongly says Isabella. This must have been devastating, but there is no mistake as it is with the family Bible and has been passed down for generations. Wondered if there was any record of John”s death or Burial? I’m looking for information on the Hill/Brown/Briggs family. My granddad was William Robinson Hill and grandma was Mildred Brown she was born in 1899 I think at South Views. She married William in 1921 and died in 1981. They lived in Jasmine Crescent. If anyone has information or knows of any living relatives please contact me. My great great grandfather, Arthur Joseph Wardle (b 1847) (aka Joseph Wardle) married Charlotte (née Smith) at Trimdon Colliery in 1869. He, Charlotte and children were detailed in the 1881 Census in Kippax near Leeds. In 1886, Charlotte married George Kimber in West Hartlepool. To date, I have not found out what happened to Arthur Joseph. George and Charlotte’s daughter, Mary (Polly) was born in 1891 in Trimdon Colliery. In 1893, the family emigrated to Louisville, Boulder, Colorado. My great grandfather, Thomas Wardle, had already moved back to Staffordshire well before the family emigrated. If anybody can enlighten me on the fate of Arthur Joseph/Joseph, I would be most grateful. Henry Curry Greenwood married Emily Moore/ Birkett stepdaughter of my g-g uncle Adam Birkett. Emily is listed as Birkett on every record I have found, but her mother Anne Moore was an army wife in Gibraltar before marrying Adam. I have more family info if of interest. I am trying to trace a Doreen Scott, who lived in Trimdon, the family home was a terraced house which stood on the right at the bottom end of the village, that is when you traveled from the road that led into Sedgfield. I think her father owned a butchers shop at the time, I think she also had a brother. This was 50 years ago. Keith Rennie asked about Doreen Scott, Trimdon Village. Doreen is my cousin on my dads side (Wardell) she did live in what’s is known as Hillcrest, Trimdon Village when she was living at home with her parents Wilf and Maggie Scott, Maggie was my aunt. Doreen had two brothers George who had the Butchers business in Triimdon Village and Kelloe where he lived and still does,, and Alan who lives in Trimdon Village. All three now in their 70’s. Doreen is now called Smith and lives in Newton Aycliffe.